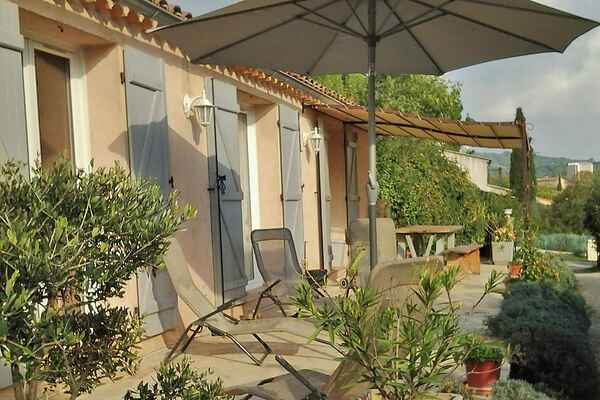 This cosy and charming holiday home is situated in a peaceful part of the southern French town of Draguignan. A perfect base for your holiday in the Provence. The house comes with a lovely Japanese garden with beautiful sculptures. Enjoy the privacy and tranquillity of here and your own small private pool. With or without a book and perhaps accompanied by a glass of regional rosé wine. In the direct vicinity, you'll find several good vineyards and many picturesque villages. Visit pleasant Flayosc and colourful Fayence. On Tuesdays, you can buy souvenirs on the large Provencal market in Lorgues. For a day at the beach, you could visit the attractive seaside resort of Sainte-Maxime; at the end of the day you could take the little ferry over to the famous fishing village of Saint-Tropez, where you can admire the rich and famous. Sports enthusiasts should go to the magnificent canyon Les Gorges du Verdon, sometimes referred to as the European answer to the Grand Canyon.